A dramatic northern view and the desire of the owners to build a guest retreat shaped the design of this home. The challenge was to frame the northern view while at the same time opening the home to the breezes and natural light from the south. 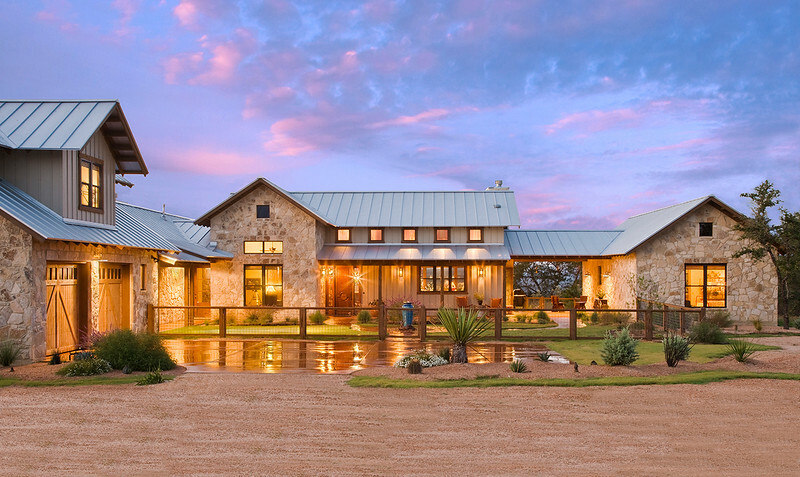 The plan is organized into three components to provide privacy and comfort for the many guests that visit High Ridge Ranch. The Main House includes the owner’s suite and is the primary gathering place. The bunk house, containing two bedrooms and a living area, is connected to the Main House by a Dog Trot. The Bird’s Nest, an efficiency apartment, is located above the Garage. The three components are accessed from a south-oriented courtyard that captures southern breezes and sunlight. The Dog Trot connects the south yard with the north and is the primary outdoor room. Reclaimed barn siding and timbers are used in the interior of the Main House. The Great Room and Kitchen are oriented on a North-South axis to frame the view of distant northern hills and to capture the southern sun. Several Green Design features are incorporated into the project, including non-ventilated, insulated attics and on-demand water heating.